Our Higher Level apprenticeships and Degree apprenticeships are aligned to Level 4 and Level 6 standards. For our Digital Innovation programme, aligned to the Level 4 Software Developer Standard and the Level 6 Digital and Technology Solutions Degree Apprenticeship, we use a Foundation and BSc. Degree as the core learning component validated by the Open University. Our new Data Analytics and Visualisation programme aligns to the Level 4 Data Analyst standard. We have worked with industry experts to iteratively design our curriculum to ensure we equip all our apprentices with the solid foundations to become competent developers and analysts from day 1 in your role and go on to develop the beginnings of an expertise in their chosen area. All apprentices commit to an initial two year programme beginning with our 8-week full-time Launchpad training. After that, apprentices follow a block release schedule consisting of 7 weeks at the employer and 1 week back at Ada, for the remainder of their apprenticeships. 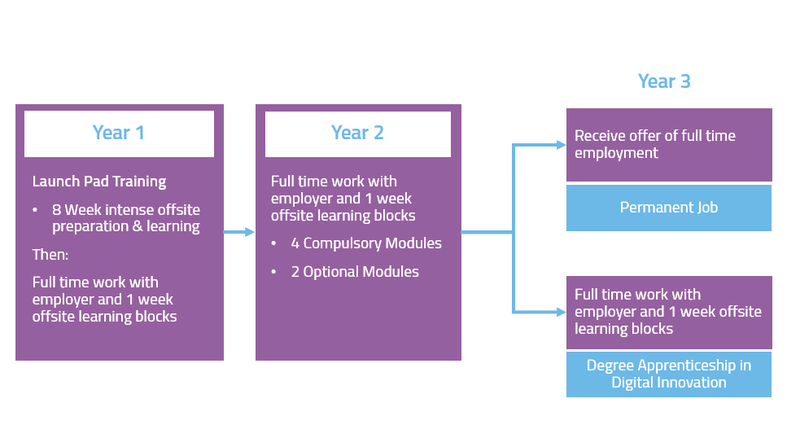 Many apprentices, in conjunction with their employer, look to extend the apprenticeship to a third year to allow the apprentice to top-up to a full Bsc. Degree Apprenticeship. In total, apprentices spend 80% of their time at their workplace and 20% in the classroom. Our Digital Innovation apprenticeship is aligned to the Level 4 Software Developer Standard. With this programme students have the option to select pathway modules focusing on either Technical, Entrepreneurial or Creative routes. Our Data Analytics & Visualisation apprenticeship is aligned to the Level 4 Data Analyst Standard. There is an optional third year of study with Ada to top up to a full Bachelor of Science (Hons) for the Digital Innovation Programme following the same block release model.